Review by AllTheBestFights.com: 2015-05-08, fight not particularly good between Artem Levin and Simon Marcus: it gets two stars. Artem Levin entered this fight with a professional kickboxing record of 85-7-1 (34 knockouts) and he is ranked as the No.1 cruiserweight in the world. He suffered his last defeat in 2013 when he faced Joe Schilling (final of the Glory 10 Mw tournament), since then he has won seven consecutive fights taking revenge on Schilling in his last bout (valid for the Glory Mw title, Schilling vs Levin 2). His opponent, Simon Marcus, has an official record of 42-2-1 (24 knockouts) and he entered as the No.4 in the same weight class. He has already fought three times in 2015 losing to Fang Bian but then he has won the Glory Mw contender tournament beating Wayne Barrett (=Marcus vs Barrett) and Jason Wilnis (=Marcus vs Wilnis). 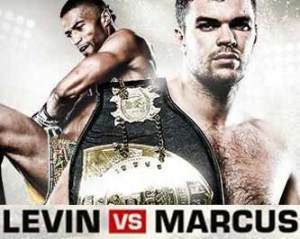 In the first fight between Levin and Marcus the Canadian defeated the Russian via unanimous decision (March 15, 2013, Levin vs Marcus I); this second fight, main event of Glory 21, is valid for the Glory middleweight title (Levin’s first defense). Watch the video and rate this fight!